Q: On November 14, the Second Leaders' Meeting on the Regional Comprehensive Economic Partnership (RCEP) was held in Singapore. The meeting issued a joint statement saying that the RCEP negotiations have achieved substantive progress and that all relevant parties expressed their determination to reach the agreement in 2019. What is your comment? A: With regard to Premier Li Keqiang's attendance at the Second Leaders' Meeting on the RCEP, we have issued the relevant information. The RCEP agreement is the most important free trade agreement of the largest scale which is under negotiation in the Asia Pacific. After its conclusion, the agreement will cover nearly half of the world's population and almost one third of the trade volume and the region it covers will become the most dynamic free trade area with the largest population and most diversified members. During this meeting, all relevant parties agreed that against the backdrop of the surging anti-globalization and protectionism, concluding the negotiations on the RCEP is of great importance in that it will help boost the confidence of various sectors as well as the positive prospects, send out the clear signal of upholding the rules-based multilateralism and free trade and greatly promote regional economic growth and economic globalization. Over the past year, under the guidance of ASEAN and the promotion of Singapore, the rotating chair of ASEAN, the RCEP negotiations have achieved substantive progress and all relevant parties have demonstrated their strong willingness to conclude the agreement. 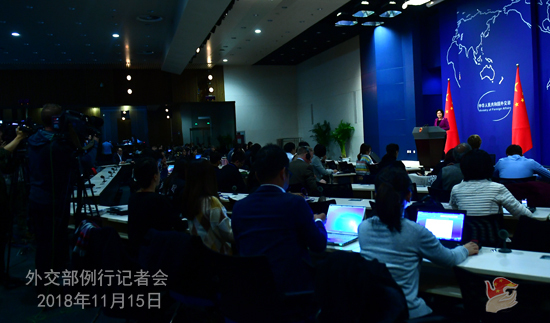 Just as Premier Li Keqiang pointed out, now the negotiations have come to a crucial stage and that all relevant parties should renew their efforts, sustain the positive momentum and wrap up the deal with the finishing touches. 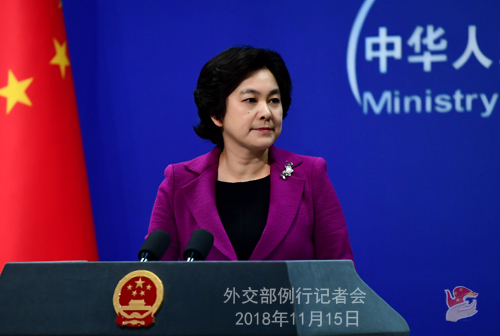 China stands ready to work with all relevant parties to advance the negotiations under the principles of mutual respect, mutual understanding and mutual accommodation so as to strive to conclude the talks in 2019, reach a comprehensive, modern, high quality, and mutually beneficial agreement, promote regional economic integration and deliver benefits to the people in this region at an early date. Q: Fifteen ambassadors to China have presented a letter to seek an audience with Xinjiang's local authority and expressed their concerns over the situation in Xinjiang. Does China have any response to this? A: I just saw the Reuters' report on this. I don't know why you chose to publish this kind of story? Do you think that it is meaningful for 15 ambassadors to write such a letter? Xinjiang is an open area. You all know that over 100 million visits have been made to Xinjiang either over the past year or in the first three quarters of this year. If these ambassadors want to go to Xinjiang with goodwill, of course we welcome that. But if they want to go there to pressure the local government, then that would be problematic. Besides, that would also exceed their mandate under the Vienna Convention on Diplomatic Relations. An ambassador is supposed to promote the mutual understanding, mutual trust and cooperation between the receiving state and the sending state, rather than raise unreasonable requests and interfere in the internal affairs of the receiving state based on hearsay. Maybe you could interview these ambassadors and ask them whether they have got all the facts straight before writing this letter. Do they know that we have another 54 ethnic minority groups besides the Han and the Uyghur? Do they know that China has more than 40 laws and regulations including the Constitution which have clear stipulations on ethnic minority groups' usage and development of their languages and cultures? Maybe you could ask these ambassadors whether the ethnic minority groups in their countries like the US and Canada, learn English? Is their learning of English also considered as an attempt by their governments to extinguish or assimilate languages and cultures of the ethnic minority groups? These ambassadors live in China. They should know that many of the well-known stars in our cultural and artistic sectors are of ethnic minority groups, including the Uyghur group. Therefore, I see no reason why they are concerned about the situation in Xinjiang and why they try to pressure the Chinese side by raising these demands in a co-signed letter. I think what they have done is very rude and unacceptable. We hope that they could fulfill their duties and obligations as ambassadors, work to help their countries learn about China in a truthful, all-around and multidimensional way, and play a positive and constructive role in enhancing mutual trust, friendship and cooperation between their countries and China. I would like to reiterate that Xinjiang as an open region welcomes those who go there with goodwill. Anyone harboring malicious intentions and prejudice and seeking to interfere in China's internal affairs will be firmly rejected. Q: US Vice President Pence said in an interview with the Washington Post that the US is leaving the door open for a deal with China during the G20 Summit in Argentina, but only if China is willing to make massive changes that the US is demanding in its economic, military and political activities and come up with concessions on issues the US is concerned about. He also said that China must respect international rules and norms. What is your comment? A: We have noted relevant reports. For some time, we have been hearing different voices of different people from the US. I don't know whether he was speaking on behalf of the US government or in his own personal capacity. The China-US relationship is now at a crucial juncture. Its sound and steady development along the right track relies on the right choices and concrete efforts made by the two sides, which serves the fundamental interests of people in the two countries and around the world and meets the common aspirations of the international community. 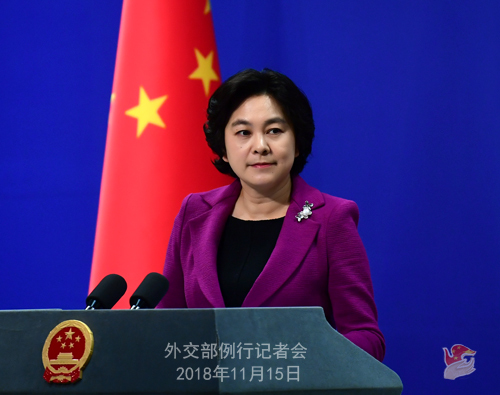 China respects the US' sovereignty, security and development interests and hopes that the US could do the same and respect China's development path that is chosen by its people in accordance with its national conditions. As President Xi Jinping said early this month at the opening ceremony of the first China International Import Expo, "after going through 5,000 years of trials and tribulations, China is still here! Looking ahead, China will always be here to stay!" On the issue of economic and trade negotiations, China's position is clear and consistent. We believe that the nature of China-US economic and trade cooperation is for mutual benefit and win-win outcomes. Negotiations based on mutual respect, reciprocity and mutual benefit make the only right way out of the current economic and trade issues. And on this issue, China owes no one, begs no one, and fears no one. The two heads of state expressed their wish to maintain the sound and steady development of China-US relations and expand bilateral economic and trade cooperation during their recent phone call. We hope that the US side could follow the consensus reached by the two heads of state during their recent phone call, focus on cooperation, remove disturbances, and engage in serious consultations on issues of mutual concern with good faith on the basis of mutual respect, reciprocity and mutual benefit so as to reach a proposal acceptable to the two sides and bring into reality the aspiration of ensuring sound and steady development of China-US relations and expanding bilateral economic and trade cooperation. On the issue of demanding China to respect international rules and norms, I would like to say that when it comes to observing international rules and norms, China is always a role model. In case you missed it, Russia's Foreign Ministry Spokesperson Zakharova spent almost 15 minutes at her November 1 press briefing enumerating the US' past record of violating or abolishing major international treaties that the US has participated in. It is time for certain people in the US to stop prettifying the US and accusing others. Q: Mike Pence said when in Singapore that he wasn't going to meet with any Chinese officials. Does China consider this as a snub or rejection? Was China hoping there would be a meeting with Pence in Singapore? A: I haven't seen any reports on these remarks by Vice President Pence. It is odd to consider the US having no plan to meet with China a snub or rejection. You may ask the US side whether the Vice President meant this when saying these words. China and the US are having a lot of exchanges and communication every day. Any meeting is arranged through consultations in accordance with the two sides' wishes. Q: On the issue of Xinjiang and the so-called "reeducation centers", are we to believe that China has no plans to allow any international observers to visit those places and improve their understandings of what China is actually doing there? A: You always refer to those places as "reeducation centers". Actually, during his interview with the media, the Chairman of the Xinjiang Uyghur Autonomous Region has said that they are vocational education and training institutions. First of all, I want to stress that like I said when answering the question raised by the journalist from the Reuters, Xinjiang is an open region and over 100 million visits have been made to Xinjiang either over the past year or in the first three quarters of this year. There is no problem for foreigners going to Xinjiang for sightseeing tours or normal exchanges and visits. However, if some ambassadors to China want to travel to Xinjiang to pressure or point fingers at the local government, just like the journalist from the Reuters mentioned in his question, we do not welcome that. You are welcome to learn about Xinjiang with goodwill. In fact, there has never been any problem for the western diplomats and reporters traveling to Xinjiang. The relevant people can surely go to Xinjiang for sightseeing tours or visits, but the precondition is that they must abide by the Chinese laws and regulations and refrain from meddling in China's domestic affairs. Certain western diplomats claimed that they would go to Xinjiang for the so-called "investigation on the human rights conditions" there. This is above and beyond the duties of a diplomat and exceeds their mandate under the Vienna Convention on Diplomatic Relations. So we will by no means allow them to do so. Like we said before, you are welcome to go to Xinjiang for normal exchanges, visits and sightseeing tours with goodwill, but we reject the interference in China's internal affairs with malicious intentions. Follow-up: Our reporters have a very difficult time just going to Xinjiang, much less trying to report on anything. Why is that the case? Why can't foreign reporters just go to Xinjiang, travel around, look at what's happening and report back without any prejudices or bias? Why is it the case? A: Like I said just now, Xinjiang is an open region and there are many trains and planes going there on a daily basis. If everyone had difficulties in traveling to Xinjiang, just like you said, then how over 100 million visits were made to Xinjiang either over the past year or in the first three quarters of this year? You said that some journalists may encounter some problems in their reporting there. I am not aware of the specifics. But I think as long as they undergo the normal procedures, there should not be any problem. Like I said just now, you are welcome to travel to Xinjiang for sightseeing tours or visits, but the precondition is that you must abide by the Chinese laws and regulations and refrain from interfering in China's internal affairs. If you indeed encounter difficulties in your normal reporting there, you can tell us and we can help you contact the local government and offer needed assistance to you. Q: Also about the letter of the 15 ambassadors. Has China received it? A: I have seen your report, but I have not seen the letter you mentioned. Q: The officials from India and China held the 9th round of Defense and Security Dialogue from November 13 to 14. This was the first dialogue after last year's standoff in the Donglang area. What issues have been discussed? Can you just offer us some details of the dialogue? A: You may refer to the recent meeting between the senior representatives of the Chinese and Indian border troops in the east section of the China-India boundary. According to my information, the two sides exchanged views on properly managing differences, enhancing border control and upholding peace and tranquility of the border areas. I am not aware of the specifics and I may refer you to the military. But one thing is certain: we are willing to make concerted efforts with India to implement the important consensus reached between the leaders of the two states and two militaries and uphold peace and tranquility of the border areas so as to ensure the sound and steady development of China-India relations.